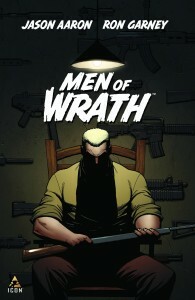 Fresh off the success of a stellar run on Thor: God of Thunder for Marvel Comics and with the success of Southern Bastards under his belt, Jason Aaron is following up with a new first issue from Marvel’s Icon imprint: Men of Wrath. The book follows the story of a hit-man named Ira Rath. In much the same manner as Southern Bastards, the main protagonist is a tough as nails older male which Aaron just seems to be able to channel effortlessly. The story introduces us to Ira much later in his life, after what we can only assume has been an existence filled with horrible deeds. The violence in this book is subtle but nonetheless terrifying. The opening panels of the book are a perfect example of how an experienced writer such as Aaron can interpret a scene and convey all the information required to the audience without wasting anything on gratuitous blood and gore. Aaron uses the story to great effect in setting up the wider story arc for the remaining issues and in setting up a cliffhanger ending for this first issue. Ron Garney does an admirable job on the art duties in this book. The art style he uses here is quite unlike any of his previous work in the superhero genre which really fits the characters and the genre. Matt Milla’s work on colours is also wonderful in this book. There is a definite and noticeable transition between the colours used to represent night and day and also between the past and the present. If you are a fan of titles such as Scalped, Southern Bastards or Thief of Thieves, then I cannot recommend this book enough. Parental Concern: Moderate. There are certainly more visceral books out there, but the themes explored here are definitely not for younger readers.